The Languedoc wine region featuring Montpellier, Nimes, and Carcassonne! Also depicts the Camargue, one of the few European habitats for flamingos! Carte des Gouvernements de Languedoc, de Foix et de Roussillon avec la Partie Orientale du Gouvernement de Guinne. 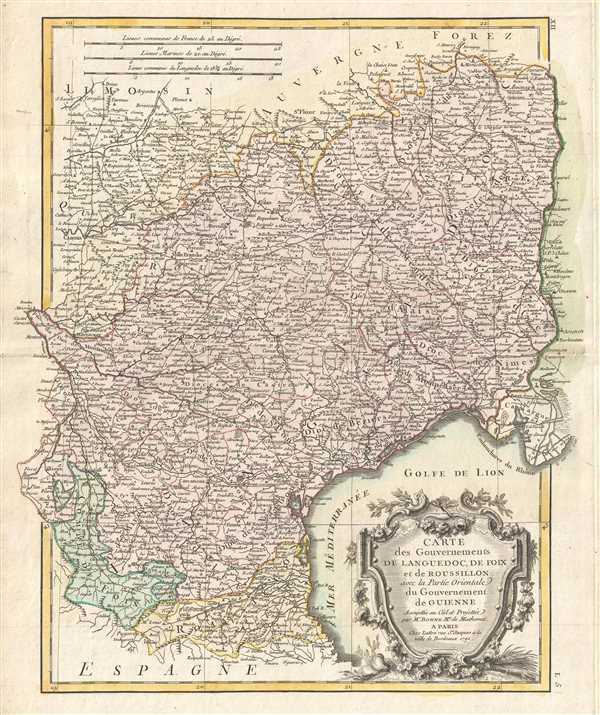 This is a 1771 Rigobert Bonne decorative map of the French winemaking regions of Languedoc, de Foix and Roussillon. The map depicts the regions in full from Auvergne and Limosin to Spain and the Mediterranean. Highly detailed, myriad cities and towns are labeled, including Montpellier, Nimes, Carcassonne, and Toulouse. Numerous rivers and mountain ranges snake across the region. Montpellier is one of the largest cities in modern France, and it is a university city. Nimes was the capital of the Roman province of Narbonne under Emperor Augustus. Today, people can visit the arena in the center of town, the Maison Carrée, a well-preserved temple, and the spectacular Pont du Gard, a Roman aqueduct. Carcassonne is famous because it is a medieval fortified town that is also a UNESCO World Heritage site. This region is also the largest producer of wine in France. The Camargue, a wetland region, is also depicted. Over 400 species of birds inhabit the Camargue, including flamingos! The Camargue is also home to Camargue horses and cattle. A large decorative title cartouche appears on the lower right. This map was drawn by Rigobert Bonne in 1771 for issue in Jean Lattre's 1776 issue of the Atlas Moderne. Very good. Even overall toning. Original press mark visible. Blank on verso. Rumsey 2612.017. Phillips (Atlases) 664. National Maritime Museum, 215.